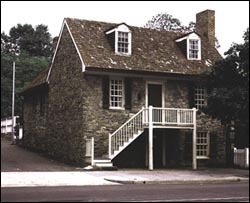 One of the oldest houses remaining in the Washington area, the Old Stone House at 3051 M Street NW, in Georgetown, is made of rock from Little Falls Quarry. The house was built in 1764 by Christopher Layman, a cabinetmaker. A good example of pre-Revolutionary architecture, this historic house has been restored to show the life of working-class people of that period; it is open to visitors. Several buildings at the National Zoo on Connecticut Avenue NW, including the Panda House, the Elephant House, and the Mane Restaurant, are also built of these crystalline rocks. Canal building stones Between 1825 and 1850 when the Chesapeake and Ohio Canal was planned and built, Georgetown was still a distinct town, separated from Washington by 2 miles of farmland and swamps. Piedmont crystalline rock was used for most of the construction, including the walls and locks of the canal, the bridges over it, and the abutments and piers of the Aqueduct Bridge, which carried canal boats across the Potomac River to the Alexandria Canal on the other side. The bridge was abandoned in 1923, and in 1962 the piers were blasted out to a depth of 12 feet below the waterline. The massive north abutment of the Aqueduct Bridge and a part of the pier nearest the Maryland shore can still be seen upstream from Key Bridge. 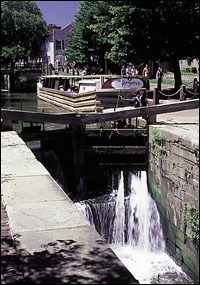 In Georgetown, the walls and locks of the Chesapeake and Ohio Canal, and one of the original bridges crossing it, are preserved. The bridge, built in 1831, carries Wisconsin Avenue across the canal. It is of local crystalline rock faced with blocks of Aquia Creek sandstone, another of the important building stones in early Washington.